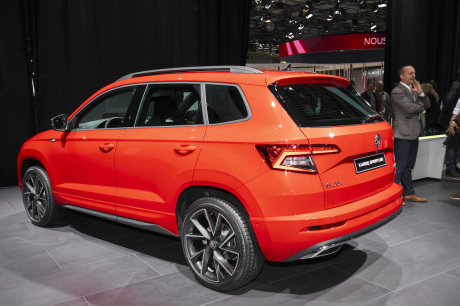 The public of the World of Paris can discover the Skoda Karoq in its new version Scout. After a year of marketing, the Skoda Karoq expands its range by adding two new finishes : the Scout, for the adventurers ,and the Sportline, calling is more sporty. Been out for a year already, the Skoda Karoq had until now only three finishes (Ambition, Business, and Style) and the limited series Access. Its range is enriched today with the arrival of the levels Scout and Sportline, that we have been able to discover in details at the Mondial de Paris. These two vehicles show personalities distinct. The Karoq Scout wants to be more adventurous and go out the panoply of the perfect adventurer, adopting particular protections of silver color on the sills and the side skirts. The Karoq Sportline is distinguished by its shields fully painted the body colour, as well as several elements painted in black as the hulls of mirrors and the roof bars. While they had been announced during the presentation of these versions Scout and Sportline, powerful engine 2.0 TSI 190 petrol and 2.0 TDI 190 diesel is still not available. The range is structured around the blocks 1.0 TSI 116 and 1.5 TSI 150 in petrol and 1.6 TDI 116 and the 2.0 TDI 150 diesel. It should be noted that the 1.0 TSI 116 and 2.0 TDI 150 are no longer available with the box DSG7 ” until further order “. The Karoq Sportline has a body kit specific, which gives it a sportier look. For the moment, the Kodiaq Scout is also available in version 2.0 TDI 150 4×4 with the manual transmission. For its part, the Kodiaq Sportline may be chosen from petrol, with the 1.5 TSI 150 BVM6 or DSG7, and diesel 2.0 TDI 150, traction or 4×4. With the basic finish through Ambition, the Karoq Scout stands out, aesthetically, by its body kit-specific (fender flares, front and rear aprons and side mirrors chrome, logos Scout) and his rims Braga 18-inch. Inside, it benefits from an upholstery specific fabric with fine finish and logos Scout, a crank alu and a pack ambient LED interior. His equipment shows more enriched by the Driving Mode Select with button off-road and the on-board computer colour. The Karoq Sportline has a specific seat upholstery and a Sport steering wheel. Please note on the Karoq Scout blades front and rear and the side skirts silver. The Karoq Sportline is also based on the level of Ambition and adds to his endowment, the camera, the Digital Cockpit, the adaptive cruise control and the pack ambient LED interior. The interior ambience is more sports, with sports seats in fabric with fine finish silver, the bottom bracket alu and the sports steering wheel, while the exterior stands out for its 18-inch wheels Mytikas, its grid of black grille and its skirts, front and rear Sportline.